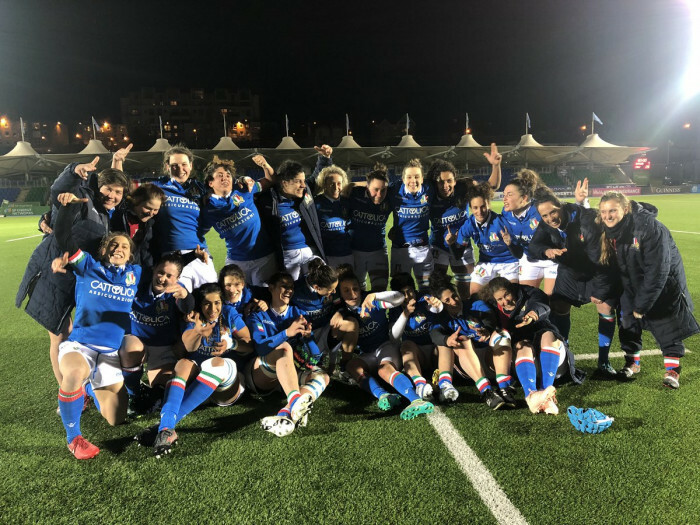 Italy came away from Scotstoun with a bonus point win, but they had to work hard against Scotland who put in a promising and much improved performance. Impressive Scots defence was the basis for a much-improved Scotland performance compared to when the same teams met in November. Italy scored early on. Their first visit to the Scots 22 resulted in a lineout on 5m, and a regulation maul and try for Ilaria Arrighetti. With Scotland reduced to 14 players only a few minutes later, another big defeat seemed possible. But Scotland dug deep, frustrated and resisted heroically, their confidence rising as Italy spurned chances, their seven-player pack proving a match for Italy’s eight. By the time they were back to 15 the pendulum had swung the other way. Scotland, with the solid base provided by their pack, were on top. Italy conceded two yellow cards as they tried desperately to keep the Scots out, but it was not enough and the home team pulled level on halftime. 7-7 and the game seemed wide open. The break worked in Italy’s favour. Rattled on the break, they were the embodiment of calm on the restart, keeping possession, going through the phases, running down the clock. Scotland barely touched the ball while Italy were down to 13, and once they were back to 14 turned the screw and went ahead with a well taken try from Giada Franco. 7-14. Scotland now threw everything at Italy, dominating possession for 20 minutes, but this time there was no way through a thoroughly disciplined Italian defence. And when Italy finally broke out after 76 minutes, they scored again – and then added a final bonus-point try from the final play of the match. With Sillari on immaculate kicking form the result was, on paper at least, a comfortable 28-7 win for the visitors – but a much closer game on the field. Scotland could be disappointed with the result but they are moving in the right direction. Italy, on the other hand, showed why they are now Europe’s third ranked team, absorbing everything Scotland threw at them, and coming away from a difficult game with a bonus point win.